Text editing and loading from .txt files. Random text generation features, counters and timers. Use all fonts installed on your PC. Font search, preview and fast-click symbol output. XYZ rotation, position and size. 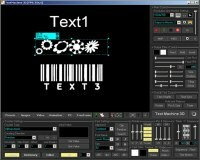 Create particles off your text, video loops, and 3D models. Control life, position and size. 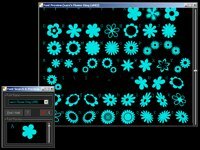 Setup particle generator presets for later usage. Use your favorite images, video loops or flash movies. Render video textures on 3D models and text. Control tiling, size, position, offset and speed. 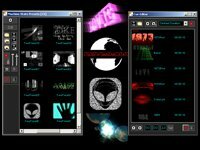 Real-time Video capture and manipulation from capture devices or web cam. buildings, room corners, deco spheres & cubes, cylindrical screens etc. 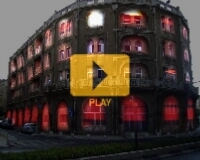 Architectural Projection Mapping in Real-time with freely configurable mapping sequences. 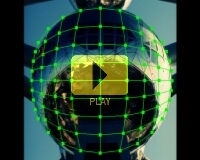 Projection Map and Mask animation with keyframes. Multi-Screen output for panorama projections or video walls. Resolution per screen up to 1920x1200 pixels and beyond. Manual output size definition for wide or custom sized screens. Realtime rendering with high framerates. 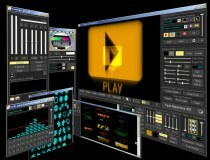 For multi-screen stage setups, multiple instances of TextMachine 3D can be launched on the same computer or on computers connected via a local area network. The multi-screen stage setup with a TextMachine 3D Network can so be controlled from the Server instance of TextMachine 3D simultaneously. 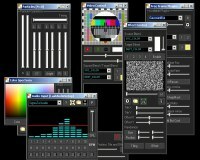 Load your favorite FreeFrame plug-ins among the provided ones. 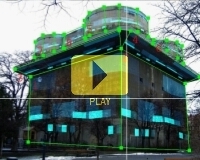 Control up to 8 FreeFrame effect parameters. Add unlimited effects by using your own effect textures. Built in feedback algorithm for blurs, trails and smear effect. 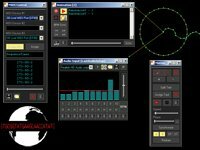 Manual parameter animation and playback. 10 band audio spectrum analyzer. Link parameters to audio input. Easy to use MIDI learn mode. Control parameters with up to 3 MIDI controllers simultaneously. Save and load your MIDI setup to file. Compose, save and load playlists. Define cues for exactly timed playback. Best for info screens or timed visual performances. Record the output to AVI using your favorite codec. Create numbered JPG file sequences for later use with other image/movie processing programs. Take screenshots and save as JPG. Adobe Flash 10 or later. Recent Laptop or Personal Computer. 512 MB RAM minimum, 1024 MB RAM recommended. 3D accelerated Graphic Card 64MB minimum, higher is recommended. Optional: Dual/Multi- Monitor System or S-Video Output for preview and playback.